Reunited, and it feels so good. 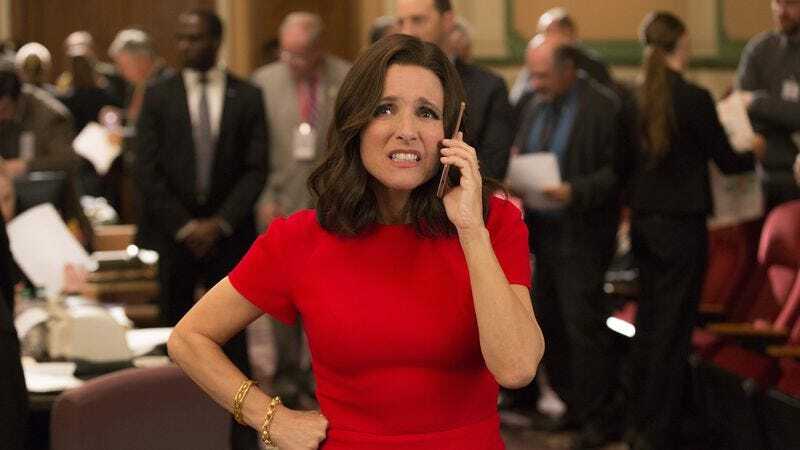 Veep has been struggling somewhat in its sixth season, with Selina listless in her new role as ex-president and the rest of the ensemble scattered to the winds. “Georgia” contrives to bring the far-flung characters back together, restoring the pairings that have worked best in the past and recapturing the energy of the show’s earlier seasons. It’s all here: Selina in a ceremonial, only tangentially powerful role, her team stumbling into the one way they can jeopardize her position, political commentary around quid pro quos and Ben’s foreign ties, physical comedy and character-based banter, and to top it off, the return of the always fantastic Sally Phillips as Selina’s best friend at the U.N., Minna Häkkinen. This episode’s tweaks to the season may be fleeting, as after returning to the U.S., the team once again splinters, but “Georgia” shows that the writers still have a strong grasp on how to deliver the Veep magic of old. The biggest change between this episode and the earlier season six installments is Selina’s regained stature. Rather than being an all-but-forgotten pushover, here the power of the United States is behind her, and that’s enough standing to spark the bribery bidding war that fuels much of the episode. Selina’s morality is tested, as it was throughout her tenure in the White House, and the tension between her self-interest and her lingering sense of duty drives each interaction after the initial donation offer. What she wants to do is never in doubt; the question is whether she will find a way to justify her actions to herself. There’s a deep feeling of authenticity when Selina asks Ben what, if any, difference there is between the two Georgian presidential candidates. Earlier she is bobbing and weaving, looking for loopholes in her conscience that will let her accept the President’s bribe and maintain the status quo or spin her acceptance of the professor’s bribe as a win for the Georgian people. By the end of the episode, however, she’s resigned. There is no good guy here. If Georgia will lose out either way, a fact that seems to genuinely disappoint her, at least momentarily, why shouldn’t she take an additional five million dollars? Having Selina grapple with this moral quandary is a much better use of the character than the Meyer Fund meetings of the season’s first two episodes. It gives Julia Louis-Dreyfus much more to play and lets her ping back and forth between shock, glee, feigned outrage, and confusion. The physical comedy of “Library” returns—Selina glove-slapping Mike across the face is particularly entertaining—but Louis-Dreyfus gets to stretch her legs, bringing back some of the season five fire as Selina confronts Jonah as well as the sarcasm and pure exasperation that comes with Selina dealing with Minna. The dinner sequence, as Selina asks Gary to test the soup for poison, is an intense power play and the best Tony Hale’s been all season, and as for Ben and Kent, Selina may not have missed their dynamic, but it’s a treat to see these three back in cahoots. While they managed to lose Selina’s election, Veep has gone out of its way to keep both Ben and Kent credible in the viewers’ eyes as political strategists. This lets Selina believably go to them for advice. They’re the characters with whom she’s the most honest, and it’s nice to see this side of Selina again. Louis-Dreyfus isn’t the only cast member who benefits from bringing the Meyer team back together. Voting buddies Gary and Mike may not quite reach the zany zenith of their airport adventure in “Tehran,” but as the beleaguered screw ups of the episode, Hale and Matt Walsh work well together. Anna Chlumsky and Reid Scott only share one scene, but it’s great to see Amy and Dan play off each other again. They understand one another in a way no one else does, and that gives little moments like Dan seeing through Amy’s Downton Abbey fandom extra resonance. Just as terrific are Sam Richardson and Timothy Simons as dynamic duo Richard and Jonah. Richard, while still a lot of fun, hasn’t worked anywhere near as well this season as part of Selina’s entourage as he did when paired with Jonah. The whimsy and beaming positivity of Richard complements Jonah’s slimy insecurity beautifully, tempering Jonah’s worst qualities, as does his genuine affection for Richard. Their friendship paints Jonah as a salvageable man-child who may yet grow into a better person, rather than a toxic abuser like Minority Leader Furlong. From Jonah’s appreciation of Richard’s literal tourist hat to the expressions on Simons and Richardson’s faces when Jonah and Richard realize the subgenre of metal show they’ve attended, the two are delightful, and hopefully the writers will come up with more ways to have them, and the rest of the ensemble, cross paths in the future. “Georgia” does not have any of the intense, barn-burner confrontations that made season five so striking, nor the memorable zingers and creative profanity of the series’ funniest episodes. What it has in spades, and what has been a little lacking so far this season, is chemistry. With Selina out of the White House, episodes like this one that bring (almost) everyone back together will likely be the exception, rather than the rule. It remains to be seen if Veep will be able to recapture the heights of its earlier seasons in its new incarnation, but while the show continues to find its footing, it’s nice to be reminded of just how great these characters are together. Stephen Fry is always good, and always funny, and his appearance here is no exception. Kudos to the makeup department for their work on his poison-wrecked face! Bringing Minna back at this point in the season not only lets us delight in Phillips’ delivery and the wonderfully distinct tone she brings to the show, it gives Selina an international peer and foil. Minna has spent much of her time as a former leader of her country working for the U.N., contributing to peace talks and working to shape global politics. Selina, after recovering from the election, has spent most of her time complaining and trading favors for money. The hints we get at Minna’s personal life here are intriguing. I’d love to see a whole episode getting a peek into her life at home and with her team. Her motives may be much purer, but I have a feeling Minna only has it slightly more together than Selina. Amy’s flouncy, overly buttoned-up blouse for her interview is a perfectly un-Amy choice by the costume department. I’m curious about the use of Georgia for this episode, as opposed to a fictional country. Georgians and those more knowledgeable than I about European political history can chime in with their thoughts in the comments, but I imagine some will not appreciate this depiction. Most of the characters get at least a few terrific, beautifully in-character lines, making a standout hard to choose. There’s the oh-so-Kent, “Hawaii is rightfully a monarchy, and will be again,” which is just edged out by his, “There is literally no Georgian law, and I am using literally correctly.” There’s Gary’s snarky, “Well, that’s why we moisturize,” and the wonderful way Louis-Dreyfus stretches out “cash” in her delivery of, “How would we make sure no one finds out about the cash?” However, the line of the episode, for me, is Selina’s insistence to Jonah that, “I will destroy you in ways that are so creative they will honor me for it at the Kennedy Center,” along with Jonah’s bungled attempt to repeat this to Richard only a moment later.